I recently participated in a short term medical mission trip to El Salvador. 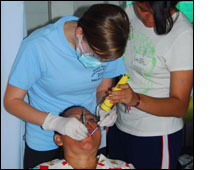 Our team is one of 52 mission teams that go all over the world and is organized by Global Health Outreach, the missions arm of the Christian Medical and Dental Association. Our team consisted of 60 members including dentists, family physicians, pharmacists, physical therapist, nurses, and medical/dental/physical therapy students. In addition, we also had people assigned to "logistics." These individuals were responsible for playing music and the kids' ministry. Signing up for my first mission trip I was unsure what to expect. My fear of the unknown disappeared quickly after receiving the most loving welcome from the Salvadorian people. There was so much love, caring, and enthusiasm. We spent seven days in the city of Santa Ana. The local church was transitioned into a clinic for the duration of our stay. We worked hard from 8 am until dusk. I primarily worked in the pharmacy with another pharmacist and four Salvadorian translators. We have had a lot of people needing medical attention and medications. We were able to use our knowledge to heal the sick with the medicines we brought; the little ones covered with scabies and besieged by parasites. Although we were there for only a short time, we were able to help about 2300 people. We gave out medications (such as antibiotics mostly for respiratory tract infections, antihistamines, antipyretics, analgesics, and vitamins), reading glasses, and lots of toothbrushes to the kids. I am amazed by the strength and conviction of my fellow team members and more by that of the local church members and interpreters. There was so much passion and love for one another and for those we were serving. It has been a joy to see how much of an impact this trip has had on them and on us. I have also had the great privilege of developing strong friendships with the many of the team members and local people.